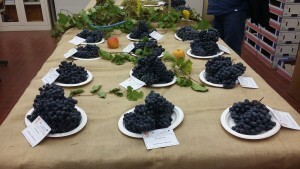 Events and appointmentsNews from the world of balsamic vinegar, participation in fairs, appointments at the vinegar factory. The proposals of the vinegar factory VBalsamic Vinegar Packs, holiday packaging balsamic vinegar, Special vinegar bottles. News from the pressPress releases and news about balsamic vinegar. A “Myth” for Modena, a dream for those who come from other lands! In the file L ’ Vinegar published by AeB Brescia of 1979, Frank Mecca, former Professor of organic chemistry at the University of Milan and a consultant for the National Association Acetieri, defined for the balsamic vinegar of Modena ” L ’ traditional balsamic vinegar is not for sale, not being able to have a commercial price, as the costs of production and ageing influence extremely important. The product is then reserved for culinary refinement of some families, who use it as a condiment, limited to very few drops or in modest quantities for flavoring l ’ normal vinegar preparation”. 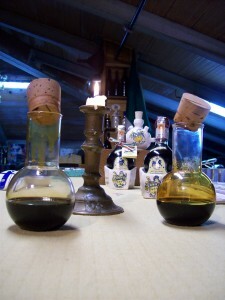 Today, Thanks to the work which began in 1966 by Rolando Simonini in Spilamberto and carried out by the Coterie and the consortium of ’ traditional balsamic vinegar of Modena, the true traditional balsamic vinegar of Modena can be brought on the market only in the special bottle from 100 ml designed especially by Giugiaro and ricoonosciuta by PDO ( ’ designation of protected origin ) already in May of the year 2000. 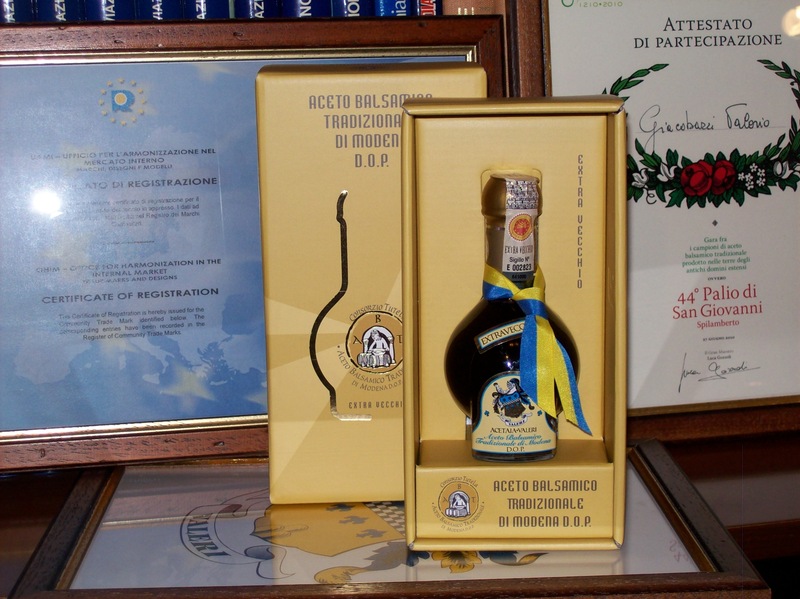 Previously our traditional balsamic vinegar of Modena had already gotten recognition by DOC ( Denomination of controlled origin ) in the year 1987. Any other package that boasts the definition “Traditional balsamic vinegar of Modena” does not comply with the rules of production and trade. As we have already mentioned the traditional balsamic vinegar is not a vinegar but a condiment traditionally. 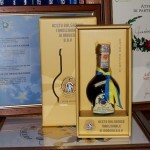 TheTraditional balsamic vinegar of Modena, DOP, is the guarantee of an indigenous proposal, produced in the Modena area and offer to the whole world in original ball designed by Giorgetto Giugiaro and bottles that are sealed by the responsible Consortium, that guarantees its production chain through a dedicated tasting Commission. A production ( misnomer ) It differs in two categories by age, 12 years honed and at least 25 years for extra old. Further years of aging can be improved only for “nectar " that enhances, between aromas and organoleptic qualities, the fruit of a slow osmosis between the liquid selected, the wood and the “precious time ". An extraordinary perception for the connoisseur or the consumer, a guarantee for the economic proposal always too selective. You get using only musts obtained from grapes in the province of Modena, Trebbiano, Lambrusco, Ancellotta, Sauvignon, Saikat and Berzemino, get evaporate and concentrate on low heat and left to ferment naturally before being placed in barrels for maturing and aging. The ageing takes place for slow acetification derived from natural fermentation and progressive concentration in different wooden vessels prized, the so-called batteries, of decreasing size and, through an annual transfer, moving from the largest barrel the next to finish in smaller from which, After years of aging that you will want to get, You can withdraw the so called "Black Gold". The color is brown, load, shining and expresses its density in a correct and fluid viscosity. 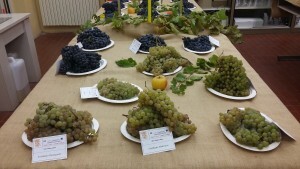 The scent is characteristic, complex, penetrating and evident pleasantly harmonized with ’ acidity. The inimitable flavour, traditionally sweet and sour in a perfect balance, It offers generously filled, savory, with velvety shades of olfactory features that make it unique. The quality is in the tradition! 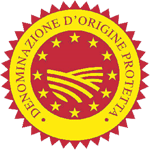 DOP – ’ designation of protected origin. Award given to agricultural products and foodstuffs whose production process, are carried out in a defined geographical area and whose production process is subject to a production Protocol. These characteristics are essentially or exclusively due to a particular geographical environment, with its inherent natural and human factors.